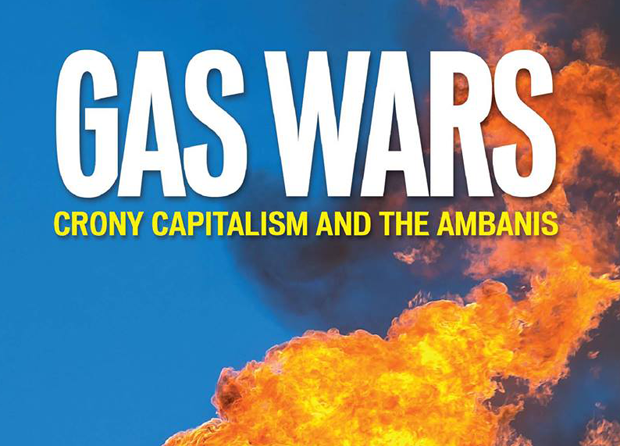 “Gas Wars — Crony Capitalism and the Ambanis” is journalists Paranjay Guha Thakurta, Subir Ghosh and Jyotirmoy Chaudhuri’s collaborative effort exposing one of India’s biggest business conglomerates’ murky dealings with the government. The authors detail how a hydrocarbon production sharing contract in Krishna Godavari, off the Bay of Bengal, in Andhra Pradesh, was allegedly rigged to benefit Reliance Industries Limited (RIL) headed by Mukesh Ambani, at significant cost to the public exchequer. The book contends that high ranking government officials, including ministers, aided and abetted the pillage of public resources. A fire-and-brimstone attorney’s notice from RIL arrived the day after the book was launched. It had quite an eerie feel to it. The notice started with a disclaimer about the Reliance groups’ highest regards for constitutional rights including freedom of expression, and then accused the authors of a deep-rooted conspiracy to malign the company’s reputation. It took strong exception to the book’s title and went on to allege that the contents are nothing but malicious canards. Nothing sort of an unconditional public apology would mitigate the harm caused, failing which, criminal and civil proceedings would be unleashed. Drawing lessons from the Wendy Doniger episode, the notice threw out a wide net. It included not only Authors Upfront and FEEl Books Private Ltd, the e-book publisher and distributors, but also “electronic distributors” like Flipkart and Amazon.in. Even the Foundation for Media Professionals, a non-governmental organisation which forwarded e-invites for the launch event, was not spared. A second notice in the same vein, this time from RNRL, followed soon after. Why does the book roil the Ambanis? In an interview, Guha Thakurta, one of the authors, revealed that the book delves into how both the central and the Gujarat governments worked hand-in-glove with the Reliance companies in structuring the deal. In effect, the government kowtowed to the companies’ diktats, the authors assert. It went out on a limb to hike the price of gas, and was stopped in its tracks by the Election Commission. Moreover, it has become a hot-button political issue since the Aam Aadmi Party, which is contesting the elections on an anti-corruption plank, has left no stone unturned to relentlessly question the Ambanis and Gujarat chief minister Narendra Modi, who is running for prime minister. The questions have so unsettled the Reliance companies that they have taken to an “Izzat (honour) campaign” and SMS blitz to convince Indians of its innocence. Further, the companies claim in court that they are victims of a “honey trap”- apparently the government isn’t the custodian of the country’s natural resources and had lured them with false promises. Guha Thakurta maintains that he has acted in the finest traditions of fairness and journalistic integrity. Senior officials of the companies have been interviewed, their views, refutations and assertions–everything has been presented. But his travails in publishing the book provide cause for consternation. Self-publication was the sole option, if one goes by Bloomsbury India‘s craven surrender. For the record, not only did it withdraw a book which would have exposed how India’s national airline was bled dry, but went ahead and apologised to the minister who threatened to sue for libel. A leading national publisher had been approached, and a deal had been worked out, but Guha Thakurta decided to go solo when substantial changes were demanded. For Reliance, intimidating anyone who isn’t writing hagiographies of Dhirubhai Ambani–the company’s founder–is par for the course; one is a worse offender for even whispering anything against their cavorting with officials in the top echelons of government. And their modus operandi of silencing criticism reveals the extent of crony capitalism. In its May 2013 issue, Caravan magazine published a cover story on India’s Attorney General. It bared details about how his opinions to the government were tailored to help the Ambanis wiggle out of an investigation into a graft scandal. Interestingly, three legal notices, each more threatening than the other, reached the magazine in the month of April, demanding complete silence. Caravan took them head on, but not every publisher would have the wherewithal to resist impending SLAPP suits. The threats to Caravan were benign if compared with what the Ambanis did to “The Polyester Prince”, Hamish McDonald’s 1998 biography of Dhirubhai. The plight of that book is a true testament to the Ambanis’ power of insidious censorship. Incessant threats of injunctions from every high court in India ensured that the book quietly vanished off the shelves. If there were any doubts as to the extent of Reliance Industries’ determination to suppress the tiniest whisper of criticism, they are dispelled by the latest fusillade hurled against the authors. This comes in the form of a couple of fresh legal notices laden with preposterous claims and egregious threats. The first one, dated 22 April, cherrypicks random, disjointed passages from the book to make out a case for libel. Suffice it to say, even prima facie innocuous statements have been included. Dated 23 April, the second one accuses the authors of malevolent mendacity in publishing and publicising their “pamphlet” (yes, that’s the term used to substantiate the charges of the book being a piece of malicious propaganda), and goes on to claim that even the launch event was designed to malign the companies. At that event, Guha Thakurta had quoted former Governor of West Bengal Gopalkrishna Gandhi’s statement that “Reliance was a parallel state, brazenly exercising total control over the country’s resources”. But Reliance hasn’t trained its guns on Gandhi; instead it accuses the author of slander. It is not pusillanimity but very sound legal strategy — the modus operandi of SLAPP suits, which the company adopts because taking on Gandhi, a widely respected and renowned public figure, would backfire. Playing both judge and jury, Reliance determines that a sum of INR 100 crore (10 billion) as “token damages”, to be paid within ten days, would be just restitution. Never before has any plaintiff arrogated to itself such a right even before going to court. The next claim is much more sinister. The authors are directed to remove all traces of “publicity material” — both in print and on the internet, including the website http://www.gaswars.in/. This patently means that even this particular report has to be taken off. Since when have two corporations been so imperious as to stake claim to sovereignty over the internet? An earlier version of this article identified the basin in question in the production sharing contract as one Kasturba Gandhi in Gujarat, when it should be Krishna Godavari, off the Bay of Bengal, in Andhra Pradesh. An earlier version also stated that both Reliance Industries Limited (RIL) headed by Mukesh Ambani, and Reliance Natural Resources Limited (RNRL) headed by Anil Ambani, were involved in the sharing contract, when it should only be RIL. This has been corrected. Sorry Mr Datta to bug you like this about what you have so kindly written. You have indeed made one correction in what you posted earlier — KG is now correctly stated as Krishna Godavari and not Kasturba Gandhi. However, two rather glaring sets of factual errors remain in the second paragraph. First, the KG basin is in Andhra Pradesh in southern India and not (repeat not) in Gujarat which is in western India. Secondly, and I repeat what I wrote earlier, the production sharing contract is between the government of India’s Ministry of Petroleum and Natural Gas and a contracting company led by Reliance Industries Limited (RIL) headed by Mukesh Ambani, not Reliance Natural Resources Limited (RNRL) headed by the younger Ambani sibling, Anil Ambani. RIL and RNRL had a separate legal dispute on which the Supreme Court ruled in 2010. All these and more details are available in the book “Gas Wars: Crony Capitalism and the Ambanis” that you have reviewed. Do visit http://www.gaswars.in. And, for your information, from the time you wrote what you did, two more legal notices have been received by me and my co-authors, one from a firm of lawyers representing Anil Ambani and RNRL and another from the firm representing Mukesh Ambani and RIL.